Some people are are a little confused when they see references to our "Picture Libraries" and especially when they find that there are three of them! In fact, most users don't need to bother about them. All the supplied plant pictures are held in the primary library and the other two are empty. It is perfectly fine to continue using only this one. A picture library is simply a collection of picture records held in a separate database disk file. Plant Base can show pictures from up to three libraries at any one time. At run-time the libraries are linked into the main database. If any library is unavailable, the program can continue to run without it. The library files are normally placed on the hard-disk, but can be located on a removable drive, even a read-only device such as a CD-ROM. 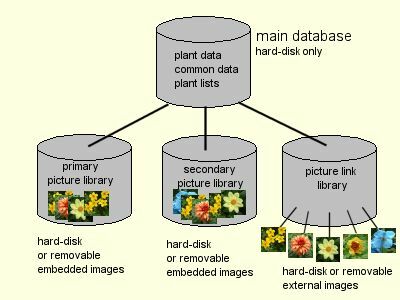 Primary (1) - is the image library that will be used most of the time, its database file is normally kept on the same hard disk as the main Plant Base database and the application's other files. However an installation option allows it to be read from CD-ROM. The picture images are stored inside the library database file itself. Secondary (2) - has exactly the same format as the Primary Picture Library, images are also stored with the database file. 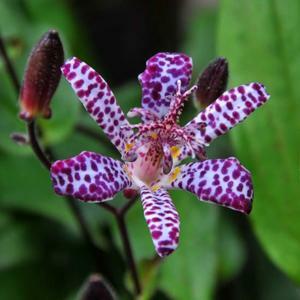 It can be used as an alternate location, for example to keep less frequently required plant images. It may be moved to a separate hard disk or recorded onto removeable media such as a USB memory stick or CD-ROM. This can save valuable hard disk space on the system's main drive. PictureLink (3) - works in a slightly different way. The database only holds reference links to your picture files and does not store the images themselves.The pictures are normal image files and can be anywhere on your PC. This library database never takes up much space and you can index as many picture files as you wish. The only disadvantage of this library is that because the image files are independant of the database, they can get moved or deleted. Good for enabling Plant Base to index images that are used for other purposes. The installation process will initially configure the picture library locations. For basic use, nothing more is required. To determine the location of the currently open database files, open the "About Plant Base" display from the Help menu. select "Open Picture Library files..." from the "File" menu. Then follow the dialog screens, using the Browse button to select alternative files as needed. Any of the Picture Library files may be copied, moved or renamed, using Windows Explorer. It is therefore easy to create backup or alternative copies. Empty library files are available on the Plant Base CD or in a downloadable zip file, if required these can be copied to your disk as the basis for new picture libraries. 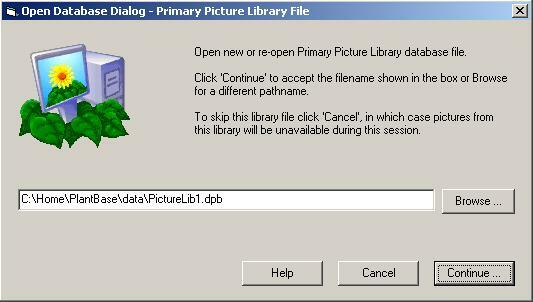 The Picture Maintenance screen and the Slide Show both have 3 option buttons to enable working with the 3 libraries. When viewing plant records from the main tabs, all available libraries are checked for matching pictures. Hovering the mouse pointer over the thumbnail or selecting picture details will show the library number.